We thought this was a funny road sign for Mexico. OK... we did chuckle. We think this is funny too, but better taken as a warning! Drinking and driving is not funny. Please read our comment below. A Lesson To Be Learned! Hummm... an appropriate road sign for Mexico, eh? And think about it... the sign is in English! You think it was some place where they expect tourists to be parting too much or something? Don't you just love some of the amusing road signs you can find around the world? 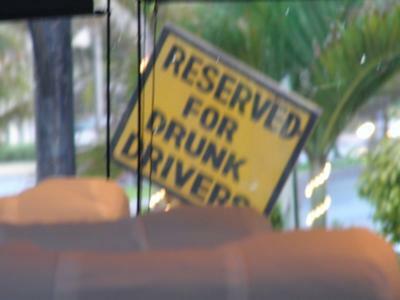 While this one is funny in a sense, it brings up the real problem of drunk driving. Sometimes I think travelers are more apt to drink when they are on vacation than they are at home... Vacations kind of free you up... your normal inhibitions may change, but you should really think about this one. While there are places where you can still have a small alcohol blood level and drive legally, there are more and more places around the world where there is zero tolerance. When we are driving anywhere in the world now, we make it a point not to have any alcohol until we are safely settled for the night... or we're taking public transportation. Sorry to get off on a moral lecture, but you know what we say on almost every page... we think we are ambassadors when we travel, and drinking and driving does not make you a good ambassador. We're thinking you should heed that sign if you're drunk.... park your car there and find another way home or back to your hotel. OK... OK... I think I’ve gone on enough. It really is a funny road sign. Thanks for your submission.